White Female Display Heads are not just for wigs anymore. Our 11 ½” tall Mannequin Head is a basic and functional display option for countertops. Give your customers an idea of what is possible by showing an assortment of merchandise such as hats, scarves, jewelry, glasses, or wigs for any women's department. 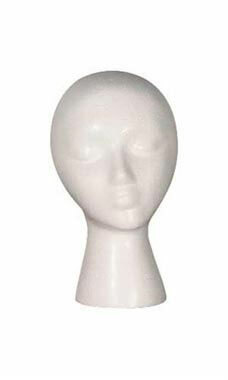 Mannequin Heads are made from molded expanded polystyrene.